Yesterday, the backup propane generator became fully functional. That's probably enough news for many of you. But, for those who may be curious about more details, here goes. The generator is a Kohler 14KW residential backup generator. We installed it on a concrete pad behind the small storage shed just outside the cabin. We installed a 500 gallon propane tank that will supply the generator as well as a second (backup?) fridge in the shed. Kohler 14KW backup generator behind the shed (which I promise to paint soon). 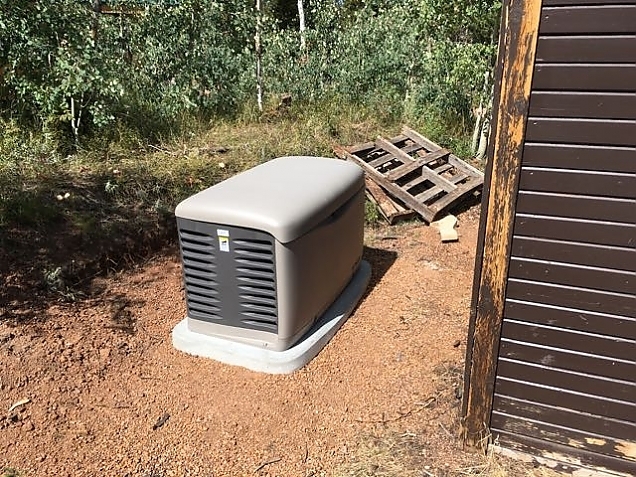 The generator outputs 240VAC, and my inverter inside the cabin takes 120VAC on its AC inputs (typically, one for grid connect and a second for a generator), so there is a 240VAC to 120VAC transformer in the shed. We used existing wiring from a previous 6KW gasoline generator that I stored in the shed to bring the 120VAC to the cabin. All that work got done a few weeks back, so we've had a backup solution since then, but it required manually starting and stopping the generator (which we have never had to do, so far). Yesterday, we dug a second trench between the shed and the cabin for a "sense wire" run. This is a wire (two, really) that runs between the inverter inside the cabin and the generator and allows us to control the generator from the inverter, either manually or automatically. 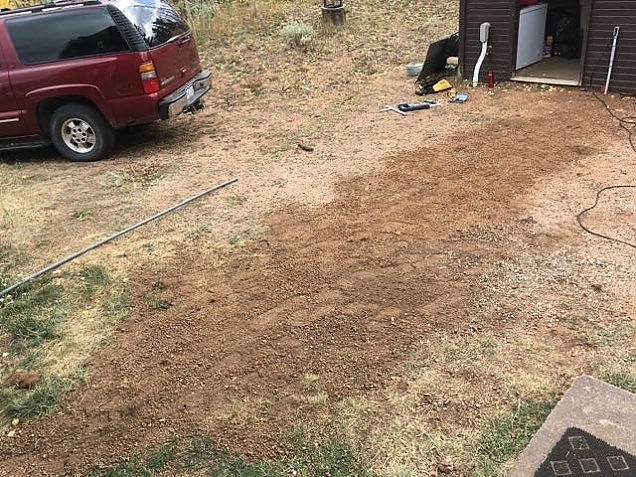 We dug a trench between the shed and the cabin for the sense wire. It is covered back up in this photo. The inverter is the electronics inside the cabin that converts the direct current (DC) battery power into alternating current (AC) house power. The batteries are 24VDC and we need 120VAC in the cabin. In addition to converting DC to AC, the inverter has the ability to take power in from the grid (does not apply in our case) or from a generator and use that to charge the batteries. And, it provides a number of generator management capabilities. 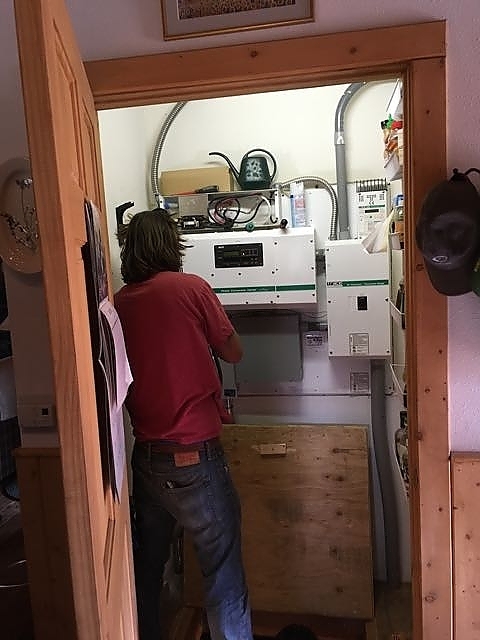 Here, John is wiring the sense wire into the inverter which is located in a utility closet in the cabin. Any time the cabin draws 33 amps AC for more than 2 minutes, the generator will start up to provide current above and beyond what the batteries are providing. This is mostly to protect the batteries from a quick discharge. I doubt we'll ever see this happen since our normal load is between 2 and 3 amps. But, I suppose if we ever had the water pump running (12A), and the vacuum cleaner (7A), and the microwave (10A), while the toaster was running (7A), it could happen. Of course, they would all need to be running for more than 2 minutes. If the battery voltage stays at or below 24.0 VDC for a 24 hour period, the generator will start. If the battery voltage stays at or below 23.6 VDC for 2 hours, the generator will start. If the battery voltage stays at or below 23.0 VDC for 15 minutes, the generator will start. Finally, if the battery voltage drops below the Low Battery Cutout Voltage (LBCV) of 22.8 VDC for more than 30 seconds, the generator will start. This is the voltage at which the whole system "gives up" and cuts off and we lose electricity. This has never happened to us while living in the cabin, but I know it has happened over winters when the cabin was vacant. Interestingly, we have had no power outages while living "off the grid", yet when living in NJ, we had frequent power outages, some lasting as long as a week (superstorm Sandy impact, for example). For the engineers in the crowd, yeah 50A does not sound like much from a 14KW generator. But, a propane generator loses about 5% of its energy output for every 1000 feet in altitude. So, at about 8500 feet, the generator output is degraded by around 40%. It could do a bit better than 50A output, but why push it? The inverter won't charge with more than 35A in any case. One final note to this post. 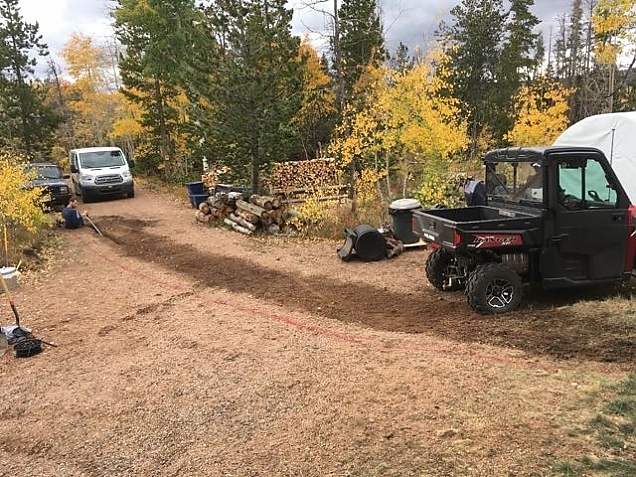 While we had the trencher (loaned by a neighbor and also used to dig post holes for the wood shed, which you can read about in a future post), we ran two strings of conduit between the cabin and the new barn. I plan to pull a 15A run through one of them so that we have one AC circuit available in the barn. The second conduit is for "future proofing". My contractor insisted on it even if we are not planning to use it. As she said "once you have the trench in the ground, you should put lots of stuff in it that you might want in the future". The second conduit could be used for a second circuit, larger wire, or who knows what in the future. Good idea. Conduit run to the barn (trench is already covered up).